'DT' Portable Rockwell Hardness Tester is developed to meet the demands of a light weight instrument which can be used to carry out tests by a universally recognised method of Hardness testing. 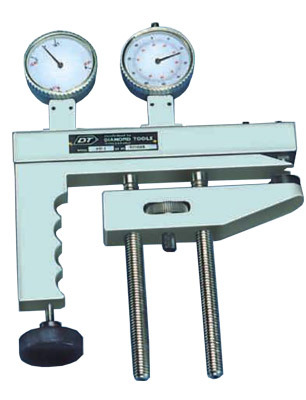 This hardness tester can be used in variety of applications and is readialy adjustable to a wide range of sizes and shapes which are difficult to test in a standard table model hardness tester. The machine is designed for carrying out Rockwell tests comparable to table model hardness tester because, the basic things, such as shape of penetrator, method of penetration, measurement and loads are same in both systems. 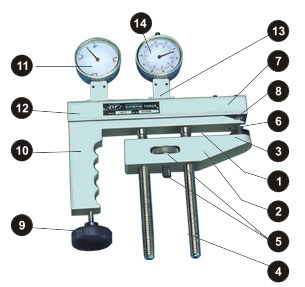 The photograph on the back side gives the general arrangement of the hardness tester. one end of this weigh bar, it is deflected and the other end of this bar carrying penetrator forces down into the test specimen. This deflection of weight bar which is proportional to the applied load is indicated on the loading dial indicator (1). Besides this loading dial indicator, there is one penetration measuring indicator (14) which measures the actual penetration of the penterator into the test specimen is read directly on this indicator. The frame carries two adjusting screws and gear train. By rotating the knurled knob the distance between the penetrator and the support-anvil can be adjusted. 1) Select proper penetrator (6) depending upon the material to be tested. 2) Take precaution so thet the penetrator does not project beyond the Upper clamp (1). For this, the loading screw (9) should be sufficiently taken back. 3) Place the test specimen securely on suitable anvil (3). 4) Clamp test specimen firmly between upper clamp (1) and support anvil (3) by rotating the knurled knob (5) on the lower clamp (2). DO NOT APPLY EXTRA PRESSURE. 5) CHECK ZERO SETTING LOAD INDICATOR (11). Rotate bezel to bring pointer over small black dot for zero load..
6) Apply 10 kgf (98.07 N). major load by rotating the load screw (9) in clockwise direction such that the pointer on the load indentor (11) comes on set position. 7) Check zero setting of penetrator indicator (14). Rotate bezel to bring pointer to ‘O’ on the black scale. 8) For ‘C’ scale use diamond penetrator against load of 150 kgf (1471 N) and for ‘A’ scale use same diamond penetrator against a load of 60 kgf (588.4 N). For ‘B’ scale use 1/16 ball penetrator against a load of 100 kgf (980.7 N). (pointer back to ‘set’ position). 10) Hardness value in Rockwell scale is directly indicated on the penetrator indicator (14). Read of number on black scale is diamond penetrator. 11) Release load completely by taking back the loading screw (9). 12) Turn the knurled knob (5) in anticlockwise direction to loosen clamp and thus the test speciman. DT Reserves the rights of change in the above specifications due to constant improvement in design.